For those of us fortunate enough to live within an hour or two of the Oregon coast, summertime means Albacore tuna season! For the folks willing to put in the time, 2 or 3 whole tuna can fill our pantries with the most delicious canned tuna anyone could ask for. Earlier this summer i purchased 2 whole tuna, filleted them myself and put up 23 half pints of tuna, seasoned with assorted herbs and spices from my gardens and froze several more fillets for enjoying fresh. It wasn’t ‘difficult’ per say, but it certainly took some time. Time spent then is time saved now. September is also the time of year (in Kings Valley, OR at least) that the garden is finally producing like gang busters. Zucchini? Yes, please! This recipe pairs both ingredients in tandem. 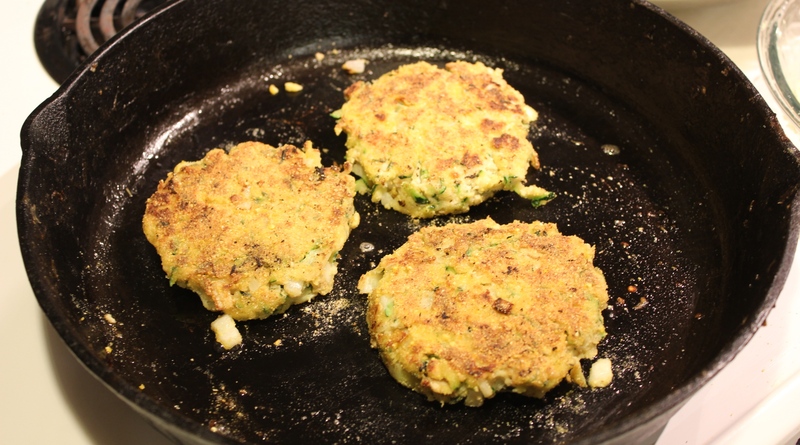 The tuna really shines, the zucchini helps the tuna go further and adds some vegetable to the dish, and the lard…… that’s another whole food preservation topic – it’s delicious and really is the best frying oil EVER. Without further ado: the recipe. First off, drain your zucchini: shred zucchini into a collander or pasta strainer. Sprinkle with salt and let sit over sink 5-10 minutes then firmly squeeze down to press out as much liquid as possible. In large bowl combine tuna, zucchini and enough panko to soak up any remaining zucc liquid. I fill the tuna jar with panko and use that amount plus about 1/4 to 1/2 jar additional. Stir in eggs and optional onion. You want the mixture to not be too crumbly and to hold together as a patty without being overly wet or dry: add more egg if dry, more panko if wet. Heat your pan to medium with a generous dollup of lard. What, you don’t render your own lard? Shame on you. You could also use reserved bacon grease, duck lard, coconut oil or butter. Form a palm sized ball and press into a patty shape. Roll this patty into seasoned cornmeal (get the extra fine cornmeal that’s finer than normal cornmeal but not as floury as masa) and put one patty at a time into the fat and cook until browned. I rotate my patties at least once so that all sides spend some time on that hotter center of the pan (my stove ain’t so great). Once brown, flip. This does take a bit of time – you don’t want a burnt exterior and gooey center. Tip: i like to prepare the cakes and put them onto a cookie sheet to finish in the oven. Since i’m also cooking oven fries, i just put the cakes into the oven for about 5 minutes to re-heat the first ones and ensure a fully cooked center. 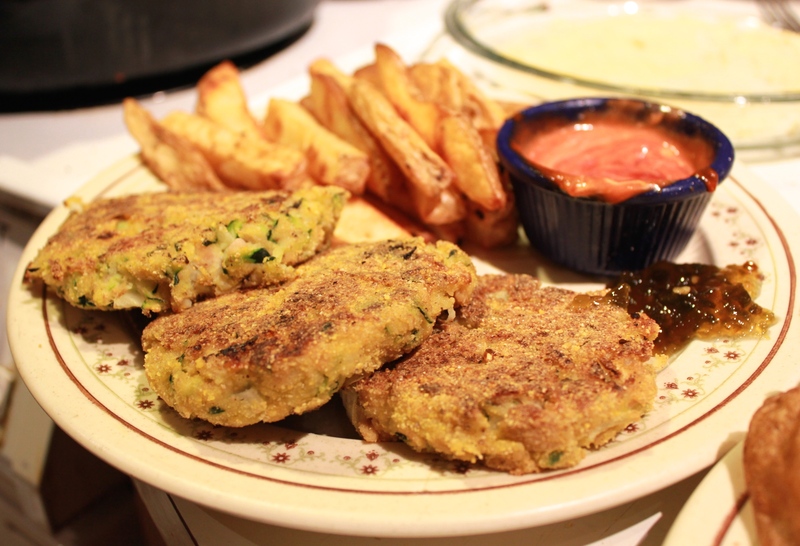 Serve with tartar sauce, ranch, ketchup, etc. We love a mix of 2 parts yogurt, 1 part mayo, minced garlic and pinch of chives. Have you ever canned tuna? What are your favorite ways of serving it? directories or other pages from your niche)? And it does it very well. I’ve been exploring for a little for any high quality articles or weblog posts in this kind of space . to exhibit that I’ve an incredibly excellent uncanny feeling I discovered exactly what I needed. I most without a doubt will make sure to do not overlook this site and provides it a look regularly.